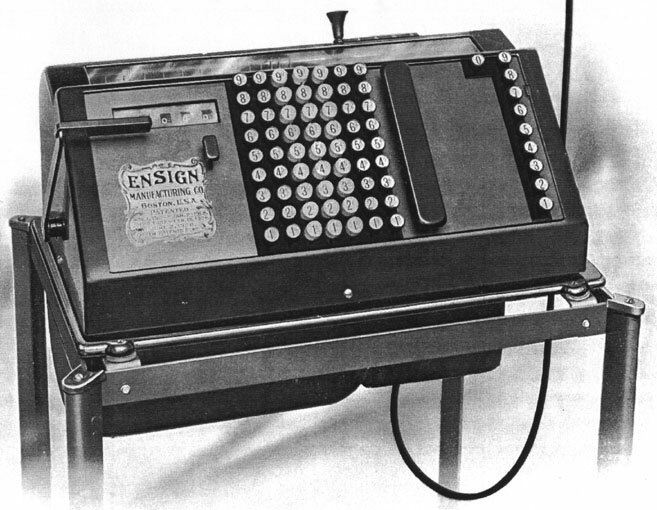 Ensign Electric Calculating Machine is a highly developed, electrically driven adding and subtracting machine, particularly suited for multiplication (by repeated addition) and semi-automatic division (subtraction and division are done by complementary addition). It was devised and patented by the mechanician from Illinois Emory Seymour Ensign (1878-1944), in the beginning of 1900s. The first patent Ensign received in 1904 (U.S. patent №773632). Later on he received several other US patents, as well as patents in England, Canada and Germany. 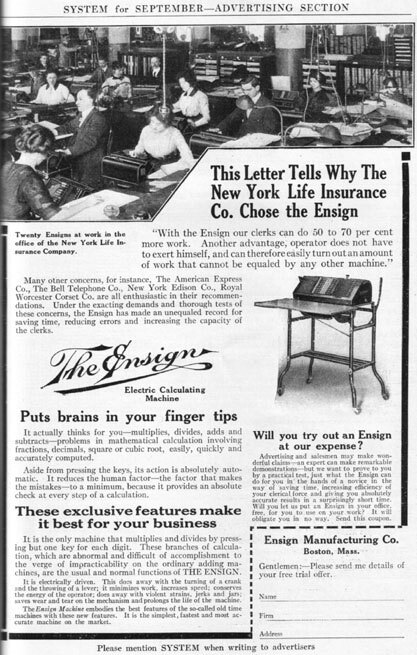 The machine was manufactured from 1909 until 1924 by Ensign's own company (Ensign Manufacturing Company of Waltham, Massachusetts, later moved to Boston and Queens, New York), and was widely advertised during this time (see the lower ad). The price of first models (1910) was $400 (Model E, 12 places for results), $450 (Model F, 16 places for results). The 1924 price was $450 (Model 75), and $500 (Model 90). The machine (see the lower image) is very heavy, with the cast iron case off, it still weighs some 30 kg, overall measurements: 16.5 cm x 50 cm x 25 cm. 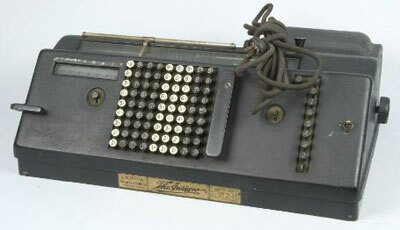 On the exterior there is a full keyboard, containing complementary digits for subtraction and division. At the right of the keyboard there is a long adding key, further to the right is the division key, and finally the multiplication keys, marked 0 to 9. To the left of the keyboard is a key that allows the value entered on the keyboard to be locked in place. At the top left is the revolution counter, and above this, within the carriage, is the result mechanism with sliding decimal marker and the carriage handle. The keys are self correcting. Addition: The first number in the keyboard, the long adding key is depressed, and this transmits the number to the result mechanism. Any number of additional items may be added in this way. The added items are counted in the revolution counter. In order to set the machine to zero, the carriage must be placed to the extreme left. Then the small lever (to the left of the revolution counting mechanism) is quickly depressed into the machine, and both counting mechanisms are cleared. The keyboard may be divided so that two rows of items may be simultaneously added by the machine (for instance, debit and credit items). Subtraction: the numbers are entered by using the small complementary digits, inscribed on the keys. Multiplication: The multiplicand is entered in the keyboard. If it is intended to multiply it by 734 for example, the digit 4 of the multiplier keys is first pressed, then 3, and finally 7. The result can be read in the result mechanism. The multiplier can be read in the revolution counter and the multiplicand in the keyboard, which provides a check on the operation. Division: First the division key is pressed, then the zero of the multiplication keys is kept depressed until the carriage is positioned to the extreme right of the machine. Then the dividend is entered, and the long adding key is pushed, which transmits this amount into the result mechanism. The digit 1, which appears in the revolution counter because of the above action, is cleared, and the divisor minus 1 is set into the keyboard, by using the complementary digits, in such a way that the left-hand digits of the values are aligned. All the keys to the left of the divisor must be set to nines. An estimate is then made as to how many times the divisor is contained in the dividend: if, for example, the estimate is four, then the 4 key of the multiplication row is depressed, the machine commences operation, and the digit 4 appears in the revolution counter. The carriage is now shifted by one place to the left and the division is continued in the manner explained. The result can be seen in the revolution counter, a repetition of this quotient in the left of the result mechanism, and the undivided remainder, if any, in the right portion of the result mechanism (separated from the other numbers by zeros). Almost nothing is known about the inventor—Emory Seymour Ensign. He was born in Illinois, in 1878. Emory married to Rose R. Ensign (nee Fisher) (b. 1881) and they had 2 daughters: Dorothy (b. 1905) and Barbara (b. 1911).